Long time no blog! Well, not a really long time, but life is full (I’m trying to say that instead of busy – it sounds better), and so blogging takes a backseat. No matter. I was wandering around the house this afternoon, and suddenly noticed lots of updates we’ve been doing lately, and thought I should show you what we have been up to. First up, we have an outdoor setting for the deck. 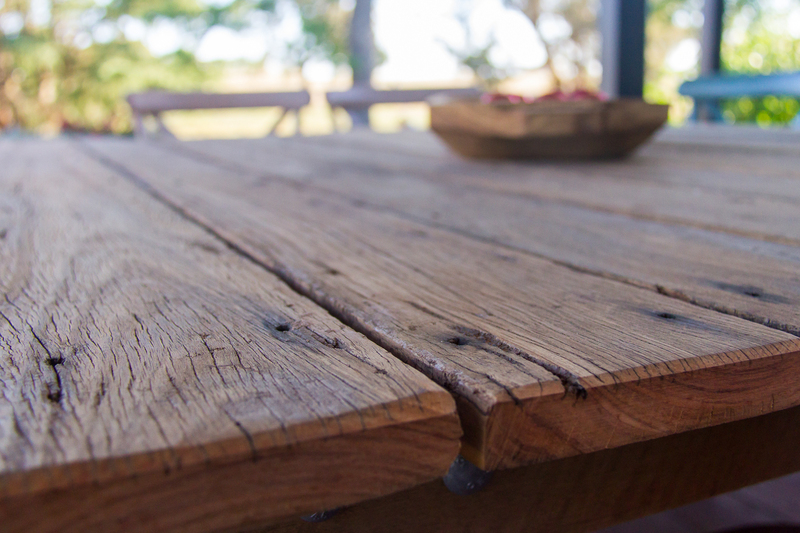 CB and my father made the table out of reclaimed hardwood timber from the old veranda that we replaced during the renovation. I love the fact that we have reused old parts of the building as well as the actual look of it. The table is heavy and is not going anywhere in a hurry. We’re still debating about whether to oil it or leave it as it is. I’m thinking oiling will make it a little darker and am leaning towards doing it. The table is designed to fit ten people around it. We eat outside almost every day in the summer, and the option of having friends for dinner and all fitting around one table is great too. 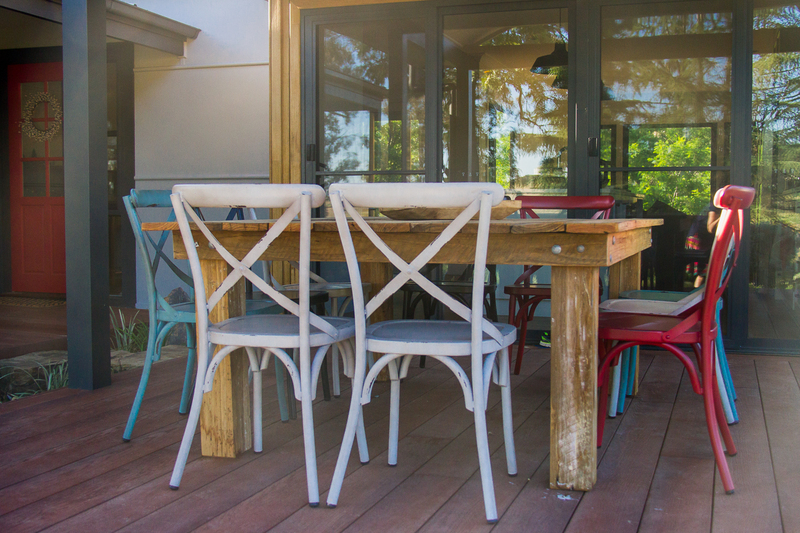 Family Christmas will be at the farm this year, and we are looking forward to sitting out on the veranda for a long relaxing lunch with everyone. 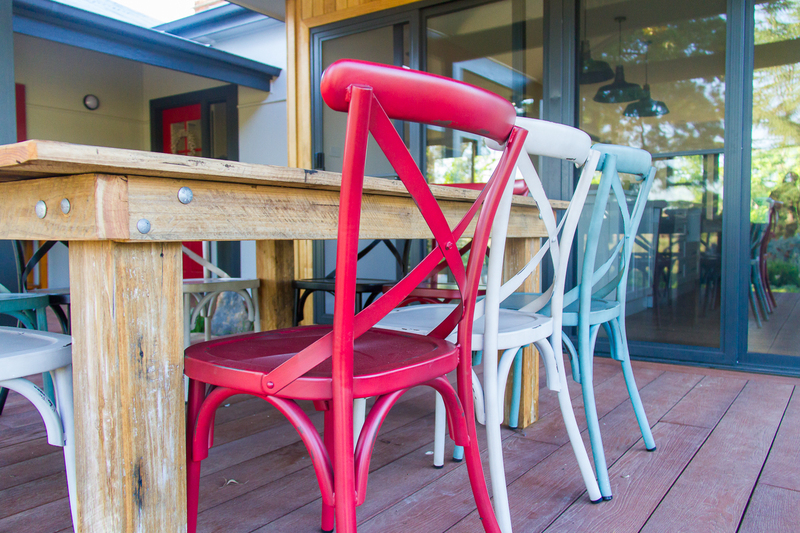 We picked up the chairs to go with the table last weekend while we were in Sydney. 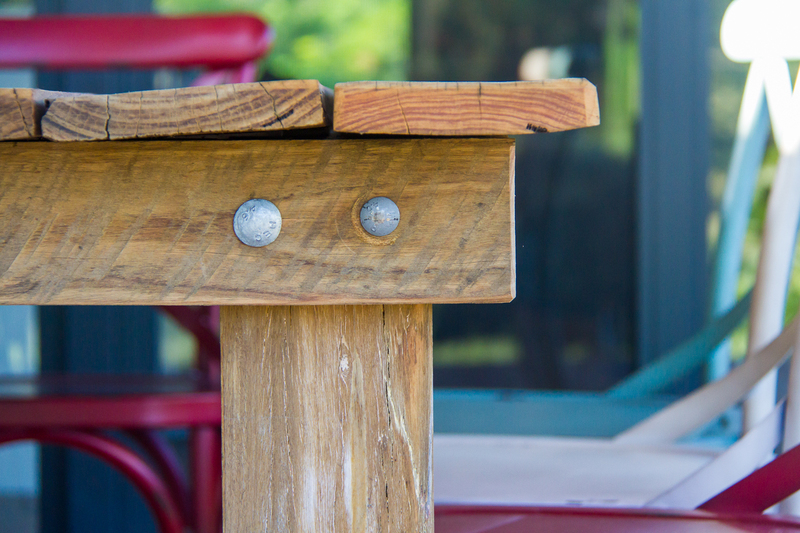 I think the contrast of the metal with the old timber works well, and I love colours so they work perfectly together. The chairs are made of steel and feel very sturdy. Being undercover means they should last a long time (fingers crossed). Next up, I picked up a runner for the bedroom hallway. I know we already have carpet down there, but I wanted a runner to add some colour and texture, and to protect the carpet (it’s a lot cheaper to replace a runner). I picked up this one on sale from Temple and Webster, where, incidentally, I’ve picked up quite a few bits and pieces lately. It’s woven cotton by Dash and Albert in Herringbone Indigo and is quite soft underfoot. 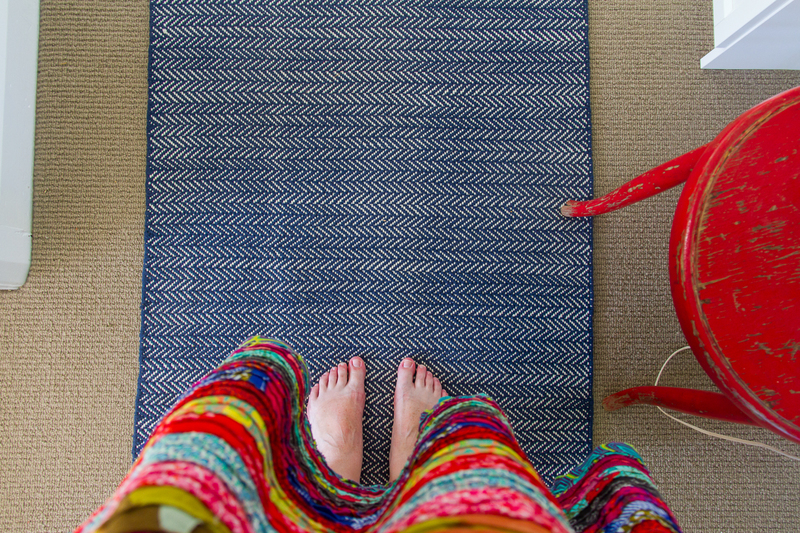 I’m rather in love with Dash and Albert rugs at the moment and am eyeing off one for the living room and waiting for a good sale to come along again. The hall is possibly my favourite room at the moment. 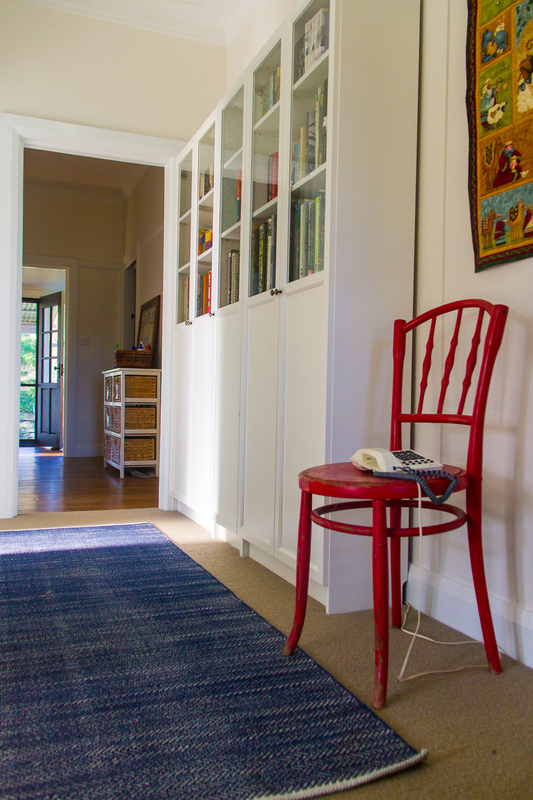 The red chair, the bookcases, and the rug make it feel calm and together. Next up for the hall is to get some proper pictures hung, but in the meantime, a Christmas hanger will do. Aside from these additions, we’ve been busy painting the south veranda. It all seems very simple, but once you get going, you notice just how many corners and edges there are to cut in. I still need to finish up the windows, but everything else is basically done. There is still the whole western side of the house to do, but with Summer well and truly upon us, we are leaving that until March next year. Inside, we’ve also had airconditioning installed – not a moment too soon, and have got a quote to get the rest of the shelves installed in the pantry. It’s something we should have done when the rest of the kitchen was being installed. We’re still really happy with the renovation, but I think there are always things you think of afterwards. The pantry and study shelving situation is the one I think of the most. We visited Kiama a few weeks back and stopped in at Bowral on the way home. 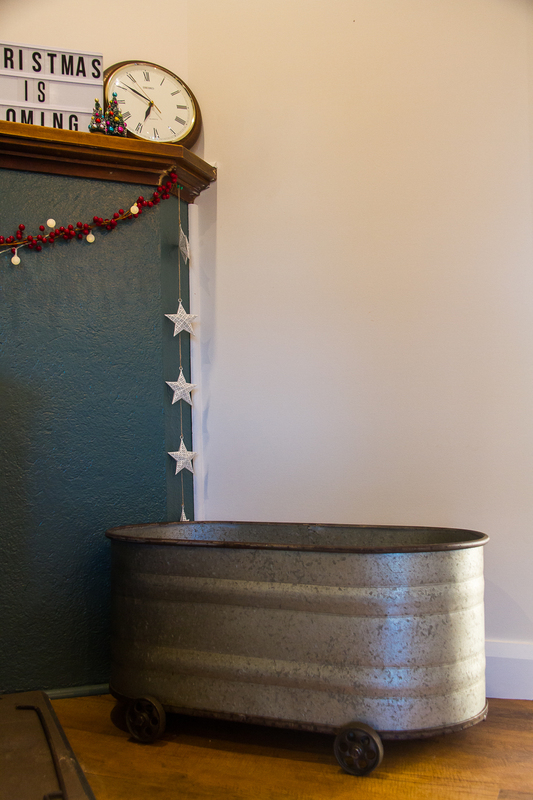 I spotted this tub in a shop there, and it looks perfect for keeping wood in over the winter months. It will save me having to go out into the chilly night to get wood for the fire each time it needs a top up – providing I remember to fill it up during the day that is! I also picked up this television cabinet which was clearance in November. I’ve been on the hunt for one for ages. Those of you who have been following along, know that I am a big fan of closed doors to help keep the dust down, so this one was perfect. My goodness, when I list everything suddenly realise how much we’ve got done this year. Facebook reminded me that just yesterday it was a year since we poured the slab and started the extension. No wonder we’re all a bit tired at the moment! Of course, there is still more to do. We desperately need curtains or blinds in the bedrooms. Waking up with the sun at 5 am is not fun. I’m still looking for the perfect area rug for the lounge area, and the study really needs some type of system to sort it out (unless you consider piling everything on the desk haphazardly a system). We’re on summer holidays now for 6 lovely weeks. I do have to prepare stuff for next year (a teacher’s job is never done), but I’m planning on taking a break first, and tackling a few of these projects. Stay tuned for details! Hi Jo, looks really nice. Great use of the hard wood. Can I suggest that you oil your table each year as it will protect it for a very long time especially as it is outside. Kind regards and Merry Xmas to you and your family. Thanks Jim! We’ve given it a coat already, and am going to do another today. Fingers crossed we remember each year. Merry Christmas to you too!